Several Valentine’s Day Sales have gone live over the past few days, so I figured it was time to get this list up and running. We’ll do our best to keep this updated throughout the week, so you might want to stop by daily just to see what’s new. I have a feeling there are still some big sales that haven’t been announced yet. Just to keep things simple, I’m not going to include any Chinese New Year Sales here. Some of those are still going though, so be sure to check out that post if you haven’t already. mightyvapors.com Vape Bae 100mL $9.99, THOT e-liquid & SALT $14.99, FREE SHIPPING over $75.00. myvpro.com Use coupon code “Love5” to get $5 off orders $55+, or coupon code “Love100” to get $12 off $100+. 50% off Cassadaga E-liquids w/ any purchase, no coupon code needed. sourcemore.com Use coupon code “LOVE” for 10% off entire purchase (excludes clearance items). 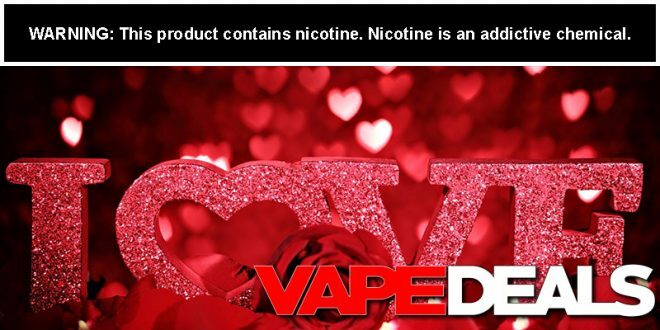 vapesourcing.com Use coupon code “Valentine” to get 10% off entire purchase. Not valid on sale items. vapewild.com Use coupon code “LOVE5” to get $5 off orders $45+ (expires 2/14). 15% off all VapeWild swag (no coupon code needed).